Besides learning reading strategies, readers learn good reading habits. These behaviors should come naturally, just like eating every day. If students understand why it is important to implement this list, they’re more likely to take on these challenges eagerly. So, I teach the list at the beginning of the year. 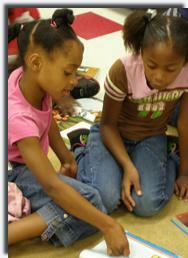 To help, I teach lessons to address good reading behaviors and explain why and how they will help the students. However, I can’t force readers to use them. I can make sure we check in periodically with one another to see how work on the habits is going. The check-ins remind readers that using the habits will improve their ability to succeed in school. In addition, they love to hear suggestions from their friends. I can read independently for enjoyment. I can read to someone, with someone, and by myself every day. I can build sustained personal reading time to 90 minutes. I can read fluently in phrases, not word for word. I can learn vocabulary! Collect words! I can ask constantly, "Does this make sense?" If not, I use fix up strategies until it does. I can set a reading goal. Periodically, I assess my goal, set a new goal, and keep a record of my progress. I can use an index card to track the words if I need to. I can cover the page with a colored plastic sheet to help the words settle down if I need to. 1. Read! Practice reading to improve. To that end, students make reading book bags. From the library, the classroom library, and home, they collect 3-5 books, comics, magazines, graphic novels or newspapers. They read on the same topic or in an author or genre series for a long time if they wish. I read, too in order to share my challenges and joys. 2. Read to someone, with someone, and by yourself every day. I’m afraid that if students get stuck reading only in their just-right levels, they will not learn how to select interesting books. Worse, they might abandon reading. What with assigning reading on breaks and during the summer, when do students find out what they love? So, I ask my students to read texts 1-2 years below their reading level, on their reading level, and 1-2 years above their reading level - every day if they can (Goldilocks' system). This includes all the reading they do in and out of school. It’s also fun to keep a list of the books read and use a coding system to remember books (or authors) they love and would read again, books to recommend to friends, and books they abandoned. 3. Build sustained personal reading time to 90 minutes. Provide time in school to build reading time to 90 minutes in one sitting. Every other Friday, build sustained reading time. Start by reading 20 minutes. In 2 weeks, try 40. In 2 more weeks, try 60. If students can not keep this pace, slow it down. At the end of each reading session, students make notes about what they noticed: if and when they got tired, whether reading the beginning or the end of a book held their attention the most, whether they needed to switch from hard to easy reads to sustain reading time, what they did to get back in the reading zone when they got tired, etc. In addition, students graph how many minutes they read each time to record progress. In my state, the students take reading tests for 90 minutes. Therefore, we tried reading texts we liked so we might manage test materials as well. Also, we tried to find out about ourselves as readers so we could address our challenges. For example, I found out that I can usually read about 45 minutes pretty well, but then I get tired. I have to take a “mini vacation” to get back in the zone: look out the window, rub my ears, stretch my mouth, and/or shake my hands. It’s fun to see students share suggestions for staying engaged. 4. Read in phrases, not word for word. We ---- don’t ---- talk ----- like ---- this ----- so ---- why are ---we ---reading ---- like this? Readers should look ahead as they read to chunk words together that seem to go together. There are no rules for how to phrase. It’s a matter of experimenting and training your eye to look ahead. (If students understand what a preposition is, you can tell them to read prepositional phrases together.) We practice on sentences in our books. Most people would read this sentence as: The playful dog --- ran --- under the fence. Some students hyper-focus on reading every word correctly and they lose comprehension. Once freed to miss some words, they relax and comprehension returns. 5. Learn vocabulary! Collect words! I give students these directions: (1) Find new, interesting, important, or FUN words. (2) Record them in a composition notebook. (3) Read the context and write your guess about what the word means. (4) Look up the word. (5) If you’re right, check it (√). If you’re wrong, choose the definition from the dictionary that matches and write it in your own words. To encourage students to collect words, set aside 15 minutes a couple times a week for students to sit with 2-3 friends and share vocabulary they found or words with which they need help. I continue to be amazed by how much my students enjoy collecting words once turned onto the hobby. 6. Ask constantly, "Does this make sense?" If not, reread or use other strategies until it does! Often readers just keep reading even when the book stops making sense or when the reader quits paying attention. A simple habit to get into is to STOP when the reader realizes he’s lost. Rereading, reading slower, whisper reading, physically getting up and moving, or asking someone what a word means are all actions readers can take to get back on track. A good habit to get into when reading stops making sense is - do something! 8. Use an index card to track the words if you need to. Some readers need to track. I teach them that it is okay to use an index card and put it under the line of text they are reading. I’ve had students who read haltingly but once given an index card read pretty well. 9. If it helps, cover the page with a colored plastic sheet to help the words settle down. Some students with difficulties love using a non-glare piece of plastic to cover the page. Marie Carbo discovered that covering the words with plastic overlays – a color unique to each reader – helps the words stop moving for these readers. At the beginning of the year, I let each student select a colored plastic sheet and try it. Within 2-3 days, most students give it back. However, every year, 1-3 students keep their plastic sheets and read with it all the time. They don’t lose it, which is proof to me that they need it. Taking turns reading in class is a common practice that can actually hinder students' reading growth. Here are effective alternatives. Once teachers confer with students, both walk away with reading goals. Description: Article explaining how we got reluctant high schoolers to take up reading again. Ideas can be applied to all 3rd-8th grade students.